The Be Present Box. FREE domestic shipping!! Since its inception in 2013, The Be Present Box has appeared on CBS This Morning, CNN, and Fox News (Washington D.C.), to name only a few. Over 1,200 Be Present Boxes have been shipped all over the world to people who have one thing in common: A desire to fight the phone addictions that have wrecked their family time, relationship attentiveness, or group productivity. Even Oprah has one! Sometimes we need help remembering what's most important. The Be Present Box helps you do that. A simple, friendly, beautifully crafted solid mahogany phone holder that reminds you to be fully present with the people you are with. The box invites you and your conversation partners to: 1. Insert Phone, 2. Close Lid, and 3. Be Present. The Be Present Box is sized to fit the iPhone 8 Plus and other large phones. But if yours is super huge and maybe it's got a really bulky case, you might want to measure its length and width to make sure it fits before placing your order. The interior space of the box is 6 3/4” long, 3 1/2” wide, 1 3/16” tall. 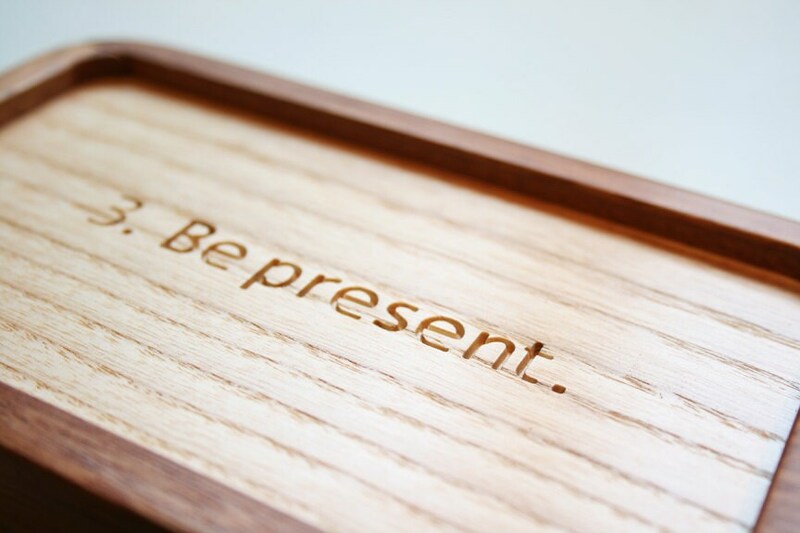 The Be Present Box is precision machined and then hand sanded and finished with a very protective lacquer, ensuring it's beauty and function for years to come. We sell a lot of these around Christmas, so get your order in early! Moonscape Wall Art, Digitally Carved From NASA Lunar Laser Scans into Mahogany Hardwood. FREE domestic shipping!! Personalized Interlocking Wood Hearts (Smaller Scale), Perfect for a Fifth Anniversary Gift! Personalized Interlocking Wooden Hearts, Perfect for a Fifth Anniversary Gift! Love this....kids actually got me to put my phone in it before I asked them to put in theirs during a recent family dinner! It’s beautifully made and of excellent quality. And one of the best gifts you can give these days. Please let me know when you start making the larger version of the Be Present Box. This one has changed our lives! Outstanding craftsmanship!! All payments will be handled through my Etsy account. You can use any major credit card or Paypal. What if there’s a problem with it? It’s hard to imagine what that might be, but who knows, maybe something will go wrong. If it does, and it’s not because you dropped it down a flight of stairs or something, then we’ll replace it for you for no charge. What if I just decide I don’t want it and the reason is none of your business? Well, okay. I offer a 30 day satisfaction guarantee on my furniture, so I might as well offer it here too. Send it back in good shape within a month and we’ll refund your money, no questions asked, except the shipping fee. Sound fair? I will carefully package your purchase in a large padded envelope or box, via the USPS.